Hi, everyone! Being able to search for any card you need, whether it's in your library or in your sideboard, has unsurprisingly proven to be a powerful effect. And that effect can turn a game that you're bound to lose into a game you can win easily. This week I have for you a few decks that attempt to harness the power of Mastermind's Acquisition. Let's get started. I have faced decks like this on numerous occasions on Magic Arena and I can tell you that they are frustrating to play against, especially if you're playing an aggro deck. Dovin's Acuity looks like a harmless enough card, but it's not. Being able to draw a card and gain two life repeatedly can cause your opponent a lot of grief. It helps you stay alive longer and allows you to draw into creature removal quicker. This deck is well tuned to play against creature-based decks. If you're playing against a control deck without a lot of creatures, you'll likely end up with quite a few dead cards in your hand. Thanks to Mastermind's Acquisition, though, you have plenty of ways to turn the corner and become the aggressor. The three main routes to victory once you've found a Mastermind's Acquisition are Teferi, Hero of Dominaria, Lyra Dawnbringer, and Nezahal, Primal Tide. With Teferi, Hero of Dominaria, as long as you have a firm control of the battlefield, you can use his +1 loyalty ability to draw additional cards for a few turns before you can get his emblem and begin exiling the lands your opponent would need to get back into the game. Lyra Dawnbringer is good to bring in if you are low on life and fear being burned out. Nezahal, Primal Tide is the finisher of choice against a control deck that could counter any creature spell you would cast. The idea for this deck is to play Smothering Tithe or Treasure Map early on, so that you can being ramping your mana. That mana will allow you to cast Emergency Powers during your main phase and you can then put a permanent card with a converted mana cost of seven or less from your hand onto the battlefield. The usual choice will be Captive Audience, which generally can allow you to win the game in a matter of three turns. Mastermind's Acquisition can help you find any of the missing pieces for this combo. In the event that you're not able to get this combo rolling, there's a couple of other ways to win. Angrath, the Flame-Chained can keep your opponent from getting things rolling by causing them to discard a card each turn while also losing two points of life. He also acts as great removal against decks that are running creatures with a converted mana cost of three or less. You also have Rakdos, the Showstopper who simultaneously acts as a big beater as well as being a form of creature removal. Rakdos doesn't generally see a lot of play, so if I were to play this deck I would have to try to win at least once by having Rakdos on the battlefield. Make no mistake, this deck wants to beat you with Zacama, Primal Calamity. What needs to happen for that to take place is that you'll need to get a minimum of one Gift of Paradise onto the battlefield. This can produce the Red mana needed to cast Zacama. It can also provide you the Red mana needed to activate Zacama's ability to deal three damage to target creature. So, you can see that getting multiple copies of Gift of Paradise in play will definitely be helpful. 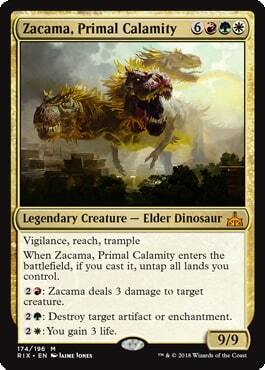 This deck doesn't have to go all in on getting Zacama, Primal Calamity into play though. This deck can win well enough on its own simply through Lyra Dawnbringer or Resplendent Angel. It has enough ways to gain life that it shouldn't be much of a problem drawing additional cards with Dawn of Hope, plus Dawn of Hope gives this deck a way to go wide by creating Soldier tokens. If you want to win with extra style points, try to win by dealing any amount of damage during combat while you have Vraska, Golgari Queen's emblem in play. Mastermind's Acquisition is undoubtedly a powerful card. Whether you use it to search your library for a tool you need, or whether it gets something powerful from your sideboard, it always has the potential to break games wide open for you. If you've had success with Mastermind's Acquisition, I'd love to hear the craziest card you've gotten with it that led to you winning the game.